As a trusted supplier to the food, pharmaceutical, and chemical industries, and to the retail trade, PetroplastVinora offers a full range of flexible packaging solutions, including carrier bags/shopping bags, technical films, and waste management products. Whatever industry you are in, and whatever solution you need, we are here to help! Not found the product you want? Do not hesitate to contact us for no-obligations advice on a solution tailored to your needs. The brands shown on this site are exclusive property of their respective owners. 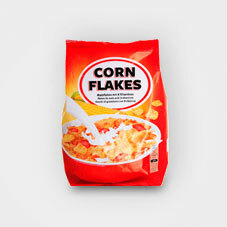 The packaging we produce for the food industry offers excellent print and design quality and outstanding levels of convenience and protection. 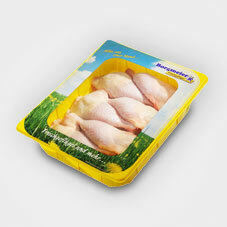 Our range includes packaging for agricultural products as well as multilayer composite films, shrink films, and stretch sleeves. Whether you are looking for films, sleeves, and bags in roll format, films for automatic packaging systems, or ready-to-use products tailored to your specific requirements, you can be sure that our flexible plastic packaging solutions will meet your needs. 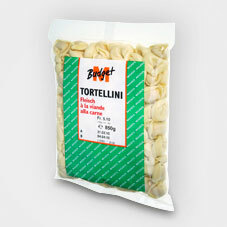 Our customers also use a diverse range of packaging solutions to assist in food production processes. 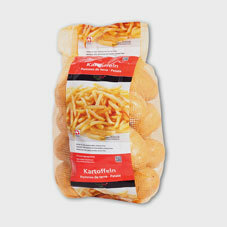 Food packaging is subject to particularly stringent requirements. 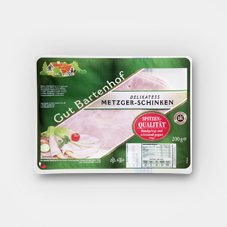 As well as ensuring that the product stands out on the supermarket shelf, the packaging must meet two other key criteria, namely protecting the content with special films and using manufacturing processes that fulfill strict safety and hygiene standards. 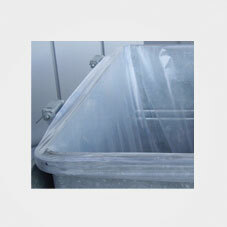 PetroplastVinora complies with all applicable statutory requirements. Our decades of production expertise, our specialist infrastructure – including a hygiene cell – and our extensive knowledge of the industry enable us to provide packaging solutions that satisfy all applicable food industry regulations. Consumers want fruit and vegetables to remain crisp and fresh for as long as possible. 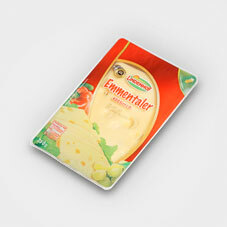 PetroplastVinora's packaging solutions for farm produce make use of special functional films designed to provide optimum protection for different types of fruit and vegetables. 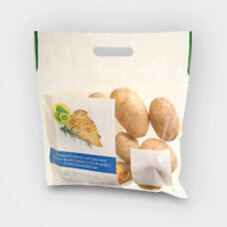 Whether you require your bags to be hermetically sealed or breathable, you can be sure of making the right choice with our tried-and-tested bag rolls for potatoes and carrots, our salad packaging solutions, and our fruit bags. 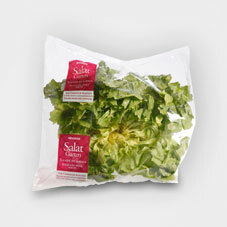 Shoppers increasingly prefer fresh produce to be pre-packed. 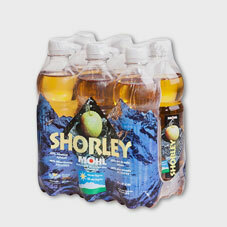 Product protection and a long shelf life are paramount, especially when it comes to perishable products. We make customizable three-, five- and seven-layer films in our proprietary extrusion process, which can also be laminated with an additional layer of film. Our medium- and high-barrier co-ex films are available in a range of thicknesses and offer additional functions including anti-fog and easy-peel. 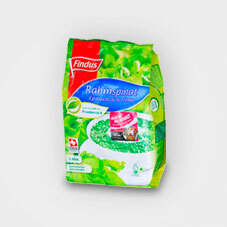 Our brilliant flexographic printing technology in up to ten colors gives packaging a stylish appearance, while convenient tear-open strips ensure ease of use. 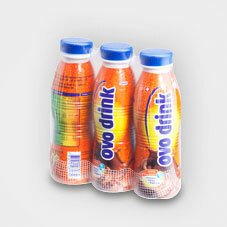 Our bottle shrink wrap sleeves are attractive and appealing packaging solutions which combine multiple benefits in a single product. As well as high transparency, excellent shrink qualities, and resistance to piercing and tearing, all our shrink films exhibit outstanding machinability. 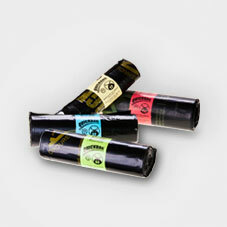 On request, our shrink film can be printed in up to ten colors on our flexographic printing presses. 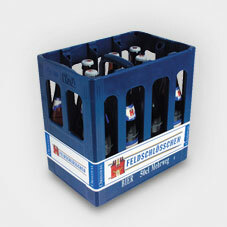 When it comes to printing information on bottles, canisters, and drink crates, our stretch sleeves are the ideal solution. 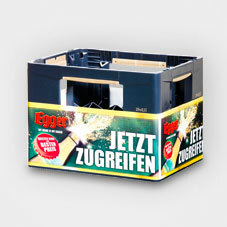 The sleeves are made from a special highly flexible, label-like, transparent or color-printed material which is stretched over the crate or canister and held in place by the force of the material as it contracts. Our stretch sleeves contain no adhesives and are made from 100-percent recyclable polyethylene, making them the perfect choice for eco-friendly recycling systems. Utilizing our long-established experience, cutting-edge technologies, and first-rate consulting services, we develop and manufacture flexible packaging solutions for a wide diversity of customers in the non-food sector. 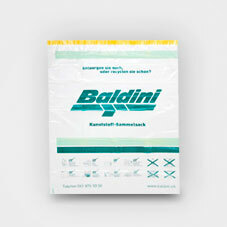 Our portfolio ranges from films for the pharmaceutical and chemical industries, and packaging for hygiene products, to retail shopping bags made from polyethylene and alternative materials. We are committed to excellence in every respect – from the uncompromising quality and hygiene standards of our pharmaceutical packaging to our extensive production and procurement expertise in the carrier bag segment. 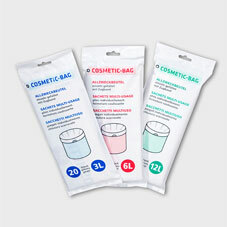 As a leading expert in flexible packaging solutions, we understand that the look, feel, and convenience of packaging play a particularly important role in the marketing of hygiene products. That's why our foil bags for toilet paper, diapers/nappies, cotton pads, and sanitary towels not only boast vibrant printing and outstanding film quality, but also convenient opening mechanisms. Available on rolls or as ready-for-use individual packaging, we offer you top-quality products tailored to your precise requirements. 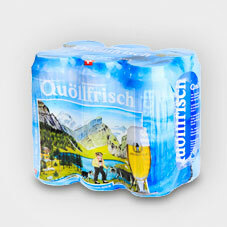 Customized solutions are also very much in demand in the field of industrial films. That's why we offer such a broad range of different sleeves, bags, and cut-to-size plastics, all of which exhibit excellent machinability. Depending on your requirements, we can supply films printed or unprinted and with or without anti-static, UV-stabilization, anti-slip and other functional additives. For the construction industry, we provide robust films which can be printed on our in-line printing machines in up to four colors with widths of up to 2.5 meters. We also offer transparent films made from 100-percent polyethylene and films containing varying proportions of recycled materials. 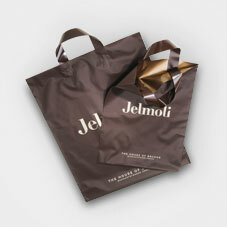 Whatever your company’s image – traditional, eco-friendly or luxury – a carrier bag from PetroplastVinora is an excellent way of promoting it. We can give you professional advice, help you develop your project and produce samples, and identify the best partners for the prepress stage, ensuring you have everything you need to get the products you want. As well as our RPET carrier bags, which are made from recycled PET bottles, we also offer high quality woven and non-woven bags and PE carrier bags. Looking for something else? 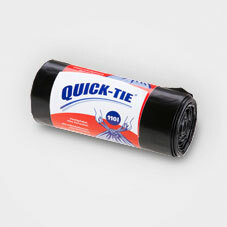 We also produce barrier tapes, plastic tablecloths, mailing bags, and so much more. Our poly bags offer the perfect packaging solution when it comes to protecting magazines, leaflets, and other publications for bulk mailing. Our specially developed transparent, anti-slip films provide effective protection for products sent by mail and are designed to create less waste after use. 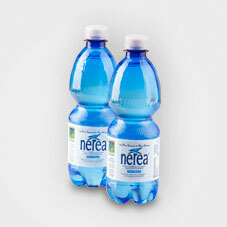 As the Swiss market leader in flexible packaging made from polyethylene and alternative materials, PetroplastVinora offers tailor-made solutions in addition to its attractive range of standard products. From carrier bags and garbage bags to top-quality pouches and poly bags, we offer a full range of products to retail and commercial businesses. We also develop and produce innovative products at competitive prices for the restaurant and catering trade, hospitals, and facility management companies. 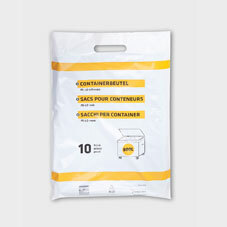 Available in premium and standard formats, our container bags and special liners come in a wide range of sizes, thicknesses and materials. 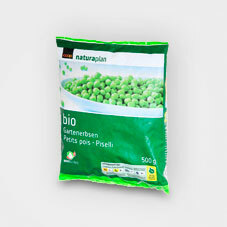 Our standard product range also includes the PetroplastVinora CompoBag, a 100-percent compostable, non-polluting and biodegradable compost bag made from biofilm. Restaurants, hotels, canteens, butchers and bakeries can benefit from our wide range of practical and modern plastic products. 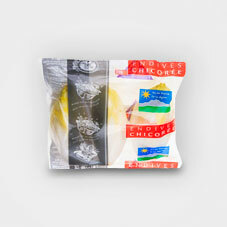 Our portfolio includes sandwich packaging as well as meat wrappers and plastic tablecloths. 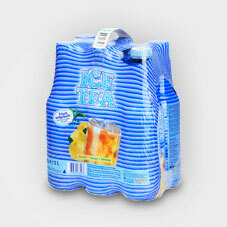 We always ensure that all our packaging solutions fully conform to food-industry regulations. 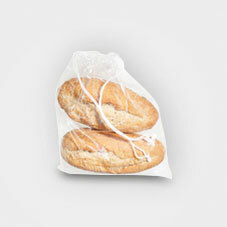 PetroplastVinora supplies hospitals and care homes with polyethylene bags for a wide range of different uses. 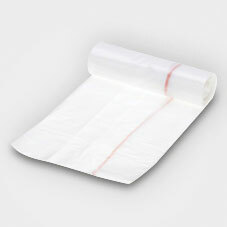 Our portfolio includes sealable bags for patients’ effects, special waste bags, disposal bags for sanitary towels, and waste bags for dressing trolleys / treatment carts. 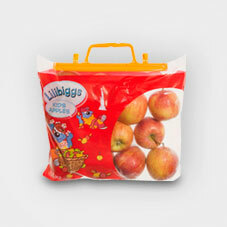 We offer a complete range of carrier bags for wholesalers and retailers, specialist stores, and supermarkets. Whatever your requirements with regard to format, material, design, and order size, our bags will help your company to project the ideal image in your target market – be it luxury, eco-friendly, low-key, or down-to-earth. We can supply you with highly robust and first-rate products in brilliant print quality which will help reinforce and boost your company's market image. 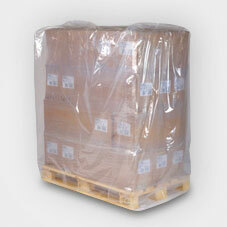 When it comes to protecting fragile or perishable products, you can always rely on our multilayer films. We produce customized three-, five- and seven-layer films using our proprietary extrusion process. 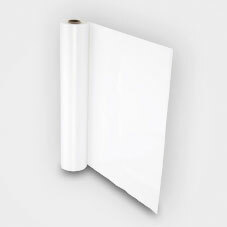 These can be laminated with an additional layer of film where required. 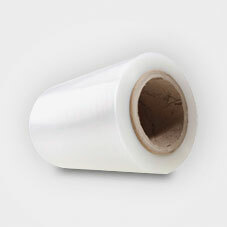 Our co-ex films provide a medium or high oxygen and aroma barrier and can be equipped with various additional functions including anti-fog and easy-peel. 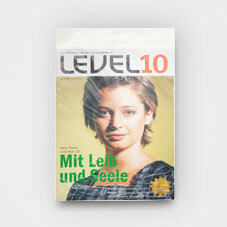 We also offer specially designed multilayer films for demanding medical, pharmaceutical, and technical applications. We produce our films in a hygiene cell under strictly controlled conditions. PetroplastVinora offers sustainable, user-friendly solutions for a wide range of applications in the fields of waste disposal and recycling. 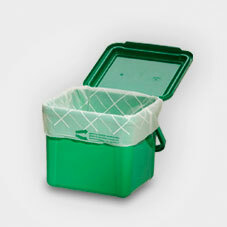 Whether you are looking for full-service waste management support for an official system of taxed garbage bags, or simply need supplies of garbage bags, container bags, or special liners, you can be confident that our high-quality products will meet the highest technical and ecological standards. We also offer 100-percent non-polluting biodegradable compost bags made from renewable resources and bags for collecting recyclable industrial waste. 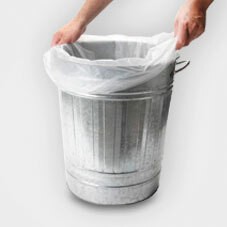 As a leading full service provider in the field of taxed garbage bags, we offer an extensive range of services to city authorities, municipalities, municipal joint boards, and waste collection organizations. From the production, storage, and distribution of taxed garbage bags to support services for individual sales outlets including billing, reminders and fee collection, we provide reliable support to our public-sector partners across the entire spectrum of the taxed garbage bag system. As you would expect, all of our products are officially approved by the Swiss municipal waste collection services (OKS label). We deliver tailor-made waste disposal solutions to customers ranging from event organizers to facility managers and industrial cleaning teams. 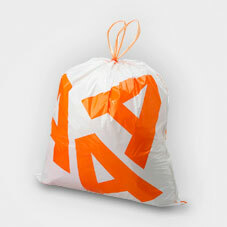 We can provide our container bags and special liners in whatever material thicknesses and sizes you require. PetroplastVinora produces bags for collecting recyclable waste which are particularly suitable for collecting and disposing of PE, PET, PS, aluminum, paper, and many other items. 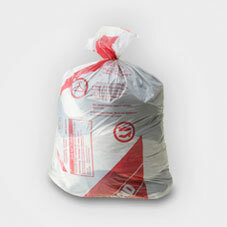 Our bags are also used for collecting used clothing. 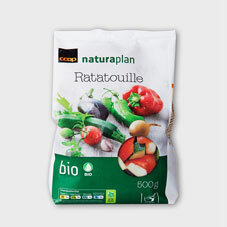 PetroplastVinora's CompoBags are made from renewable resources and comply with DIN EN 13432, which means they are completely biodegradable, compostable, and non-polluting. 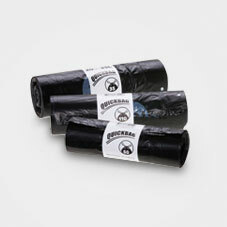 Our compost bags are available in standard sizes or can be tailor-made to your individual specifications. 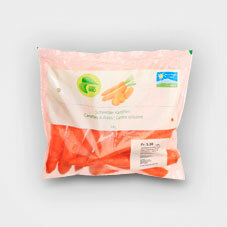 PetroplastVinora also produces carrier bags, films, and vegetable bags from the same material. Drawing on our modern infrastructure, impressively high quality standards, and many years of experience, we produce some 300 million garbage bags a year. Whether you choose a bag from our standard range or order a customized product tailored to your specifications, we guarantee that you will receive consistently high-quality products. Environmental protection is a key issue in garbage bag manufacturing, which is why we process more than 5,000 tons of secondary raw materials a year. That enables us to offer our customers sustainable waste disposal products containing a significant proportion of recycled material. 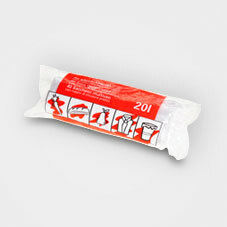 PetroplastVinora also manufactures various workplace hygiene products designed to protect people and their clothing, including disposable aprons and single-use gloves. We also provide automotive repair shops and industrial enterprises with customized solutions to protect upholstery. 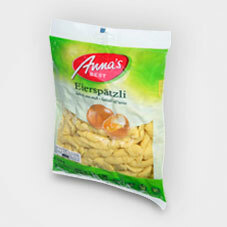 PetroplastVinora offers a wide range of fruit, vegetable and multi-purpose poly bags and pouches. Simply decide which size, thickness, and polyethylene formulation you require – and then make your choice from our large selection of top-quality standard products. As a specialist in waste disposal solutions, PetroplastVinora produces more than 300 million garbage bags a year and offers a wide range of standard products. Whatever size, thickness or type of closure you need, we can deliver our top-quality ZAKSAC, QUICKBAG, and QUICK-TIE standard products and large-format bags within 24 hours of receiving your order.